See, I may be totally scared of spiders and moths and bugs, but I don’t kill them. I couldn’t stand the guilt of killing something so innocent that is just going about its own way of life. For example, the night a huge Huntsman spider had found its way inside my bedroom and proceeded to glare at me from the ceiling as I was lying in bed. Sure, I could have woken my husband to take care of business, but if I did that, he’d kill it and leave a gigantic smear on the ceiling. So. I slowly exited the room, grabbed a very large plastic box, its lid and a chair. I placed the chair under the spider, and, with my heart racing, slowly climbed up the chair and even slower, centered the box around the spider. Then, SLAM! The spider was trapped, all I had to do was move the box a little and convince the spider to climb down inside the box. I kid you not, I was totally freaked out. I had no idea how I was even doing this. How was I even going to get the lid on quick enough? Panic!! Luckily, I had great timing and ended up with a trapped huge Huntsman spider. I then took it outside, quickly removed the lid and high-tailed it back in the house. Anyway. So back to this curled-leaf spider. As you now know, I don’t kill things. When I cleared the spider’s web from the clothesline, I placed the leaf, with the spider inside, on top of the bushes next to the clothesline. Never thought of it again. Hung up clothes. Brought them inside later. Went to bed. Woke up. The curled-leaf spider was back on the clothesline, huge web and all. This process continued for weeks – I cleared the web to hang up clothes and the next morning, the spider would be back – until I finally stopped clearing the web and just hung up clothes around the spider. I looked up information on the google about curled-leaf spiders and learned that this was probably a female. We named her Aughra (yes, I’m a Dark Crystal fan!). For at least a month she was with us. I took a number of pictures of her and her web. It was the day I took this picture above, that I made a batch of some very delicious muffins. 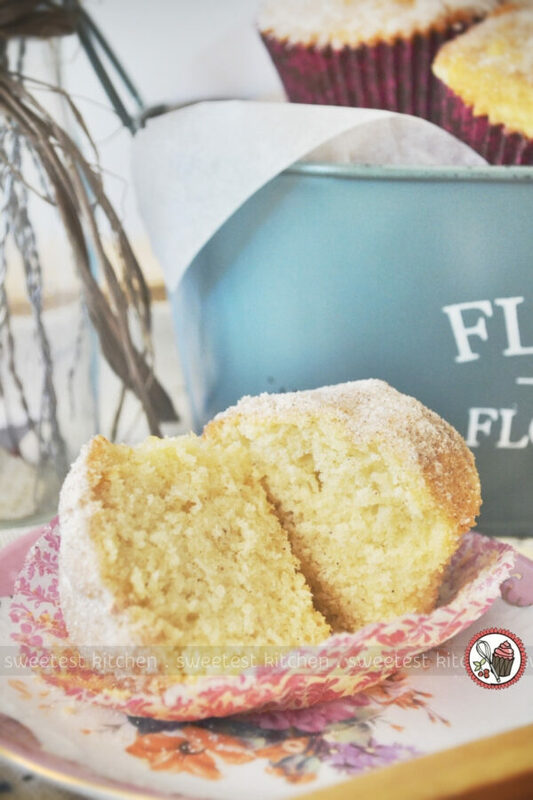 The recipe for these vanilla donut muffins comes from Beanilla, which is the only place I buy my vanilla. 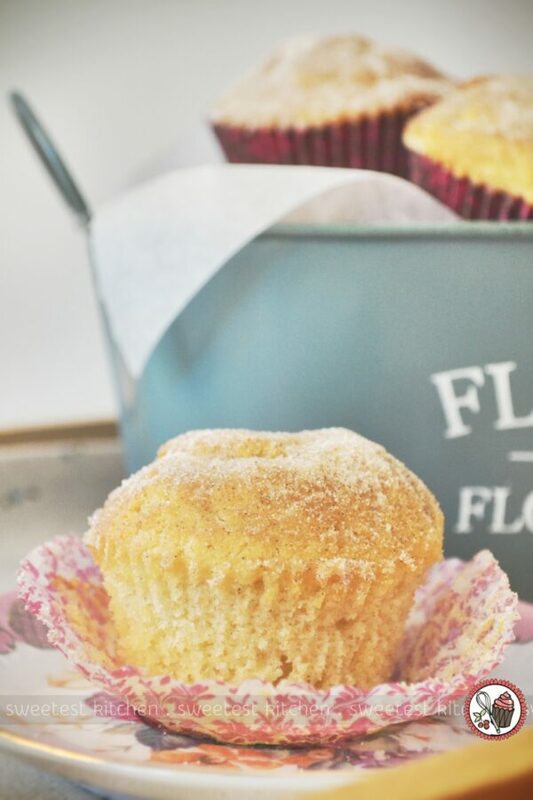 The recipe sounded lovely, with a donuty-muffin base spiced with nutmeg and flavored with Tahitian vanilla (which is the flavor I always buy), and dusted in a vanilla bean cinnamon-sugar mix. In fact, this wasn’t even the first time I had made these! And I very rarely make the same recipe twice, so you know they have to be good! They’re very easy to make, but do require the use of a stand- or hand-mixer, which is quite unusual for a muffin recipe. Muffin batter is often mixed by hand, and care has to be taken so as not to over-mix the batter. This recipe is a little more forgiving, but I only did minimal mixing once the flour and milk were added. The result is a soft, almost cake-like, crumb that is bursting with vanilla flavor. Topped with the vanilla bean cinnamon-sugar, wow! The vanilla bean cinnamon-sugar mixture is just as it sounds – a mix of vanilla bean “caviar”, cinnamon and sugar. The recipe gives you plenty of the mix, so feel free to liberally coat the muffins in it, or save some to make cinnamon toast or sprinkle over your coffee or hot chocolate. I had so much fun editing these photos – I think they look fantastic!, along with the last photos I was to take of Aughra. Little did I know that, after the wind had destroyed Aughra’s web, that she wouldn’t be rebuilding her web that night. As was then a morning ritual, I checked on Aughra first thing, and the leaf was hanging down from her tangled and tattered web. I even looked inside the leaf to confirm her absence. She was gone. She was just a spider, but with her persistence, she became a family friend and her sudden departure left us all feeling rather saddened. Have a muffin, and may this post inspire you to be just a little kinder to Earth’s creatures! By the way, this post was not sponsored in any way by Beanilla, I just simply love their vanilla products! 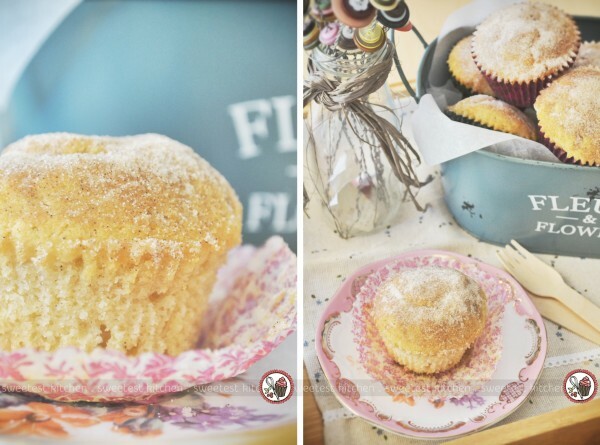 Delicious, vanillary donut muffins made with Tahitian vanilla. Preheat oven to 350F. 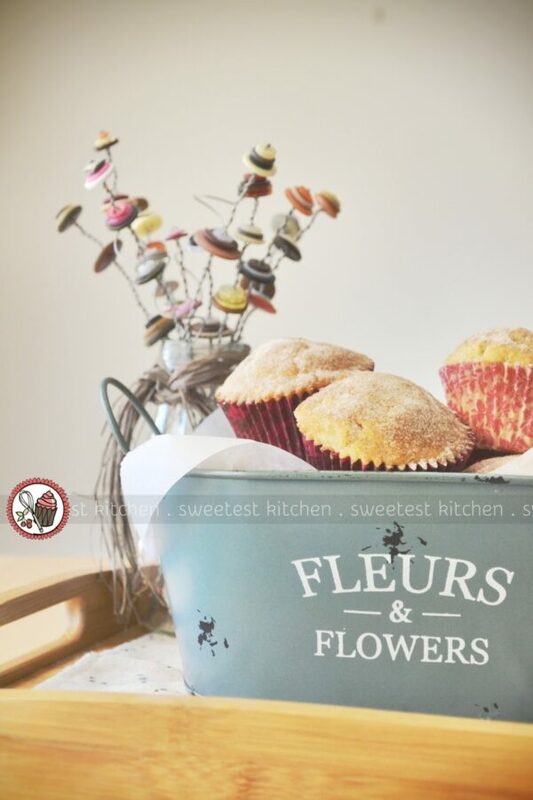 Line a 12-hole muffin tin with paper liners, or spray the muffin holes with non-stick spray. In a mixer fitted with a paddle attachment, beat the butter, sugar and vanilla extract until light and creamy. Add the eggs one at a time and beat until incorporated after each addition. In a separate bowl, whisk together the flour, baking powder, baking soda and nutmeg. With the mixer on low, add ⅓ of the flour mixture and beat until well blended. Add ½ of the milk and beat until incorporated. Repeat, with the remaining flour and milk, beating well after each addition, ending with the last ⅓ of the flour. Mix just until incorporated. Divide batter evenly among muffin liners, filling each around ⅔ full. Bake 15-20 minutes, or until the tops spring back when lightly touched and are light golden. Combine topping ingredients in a smallish bowl with a tight-fitting lid. I find the easiest way to combine the sticky vanilla beans into the sugar is to put the lid on the bowl and shake, shake, shake! Brush the tops of the warm muffins with the melted butter and liberally sprinkle over the topping mixture. Enjoy warm from oven! They will keep in an airtight container at room temperature for a day or so. *You can use any type of vanilla you have on hand, but I highly recommend that it at least be pure vanilla extract. I’m a huge vanilla freak, and these sound amazing! I’ve been wanting to buy good vanilla online, so I’ll check out Beanilla. I love the idea of focusing on the vanilla instead of the cinnamon as most donuts do! These were excellent! I just made a batch for breakfast. I was able to fill 24 mini cups and 3 regulation-sized muffins. I think a third mini pan would have done it. Perfection! Thanks for the recipe! I love vanilla! These look so soft and yummy! Hi! I made these muffins today and they were delicious! I replaced the nutmeg with cinnamon and it was so good! Thanks for this marvellous recipe! 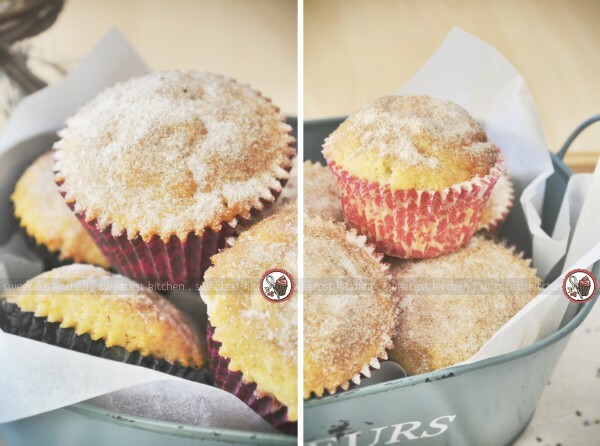 I’ve just come across your blog and would love to make these donut muffins! Could you please tell me if the measurements are in Australian or US?